Port-au-Prince, Haiti ? Hurricane Tomas flooded camps of earthquake refugees, turning some into squalid islands Friday as it battered Haiti’s rural western tip, while largely sparing the vast homeless encampments in the shattered capital. 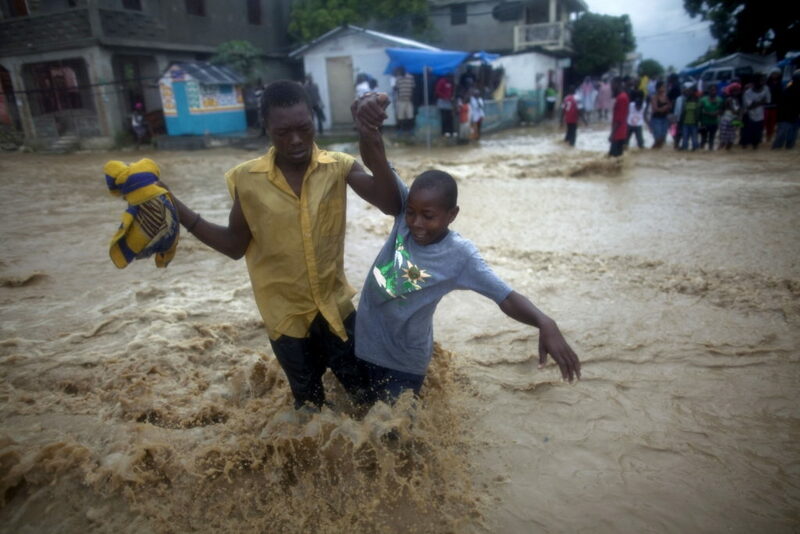 People wade through a flooded street during the passing of Hurricane Tomas on Friday in Leogane, Haiti. Aid workers rushed to guard against the spread of disease as the storm moved into the region where thousands are infected with cholera. Driving 85 mph winds and a lashing storm surge battered Leogane, a seaside town west of Port-au-Prince that was 90 percent destroyed in the Jan. 12 earthquake. Four deaths were confirmed by Haitian officials, all people attempting to cross rivers by car or on foot in the mountainous region to the west of Leogane, on Haiti’s far southwestern tip. Two more people were missing in Leogane. Tomas had earlier killed at least 14 people in the eastern Caribbean. On Friday it came ashore as a Category 1 hurricane, pummeling Haiti’s southern peninsula, before moving on to the rest of the country, eastern Cuba and the Bahamas. It could be days before the storm’s impact is known as reports filter in from isolated mountain towns cut off by the flooding. But as officials took stock and aid workers rushed to contain flood damage and the widening cholera epidemic, the storm left harsh reminders of poverty’s toll on the Caribbean nation. “We have two catastrophes that we are managing. The first is the hurricane and the second is cholera,” President Rene Preval told the nation in a television and radio address. He could have included a third. Ten months after the magnitude-7 earthquake shook the capital to the ground, the devastation can still be seen in scores of collapsed buildings and sprawling refugee camps. The disasters mingled in Leogane, where milky brown floodwaters filled quake-cracked streets and cut off a camp that was home to hundreds of refugees. “We have an assessment team there now and there’s a couple towns that have been damaged from some flooding and some wind damage,” said Steve McAndrew, head of operations for the American Red Cross. The storm’s center was about 35 miles southeast of Great Inagua Island after it lashed Port-au-Prince, where a thick gray canopy of clouds hung over the capital and a steady downpour turned streets into flowing canals that carried garbage through the city. By late Friday, its wind speeds had diminished to 75 mph. Haitian authorities had urged the 1.3 million Haitians left homeless by the earthquake to leave the camps and go to the homes of friends and family. Buses were sent to take those who wanted to evacuate to shelters. But many chose to stay, fearing they would come back to find that they had been evicted from the private land where they have been camped out since the quake, living in donated plastic tarps, or that their few possessions would be stolen before they returned.